When you exercise outside, your body enjoys many benefits which simply are not possible when you work out indoors. But you may be thinking, “What are some of the better outdoor workouts?” After all, not all exercises are the same. To harness all of the total body benefits that exercising outside can deliver, stick to the following 5 outdoor workout programs. 1 - Prevention magazine suggests tennis for an outdoor workout. You burn between 450 and 550 calories per hour playing tennis, and you enjoy the benefits of socializing as well. From your head to your toes, you involve all major muscle groups, and tennis is an inexpensive sport available to men, women and children of all ages. You can always find someone at your skill level by checking with local tennis organizations. 2 - Men's Fitness recommends hill sprints as an excellent way to shred body fat, burn calories improve your level of conditioning and develop lean muscle mass. This metabolic workout uses body weight exercise principles to strengthen your entire body. You can expect to burn between 200 and 250 calories in just 2.5 minutes of hill sprinting. 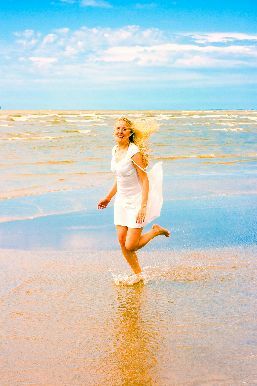 3 – The Women's Health website lists jogging in sand as the perfect outdoor exercise. The increased resistance delivers a 1.6X higher calorie burn than simply jogging on a grass or dirt path. Another benefit? Sand goes to work on your feet and toes, removing unsightly dry, dead skin. While you are at the beach, throw in a couple of games of beach volleyball to burn even more calories. 4 – Body weight training is perfectly suited for the great outdoors. You use the weight of your body as resistance, building lean muscle mass while burning fat and calories. Nothing more than your body is needed, but you can accentuate your workout with monkey bars, benches, chin up and pull up bars and other park equipment. 5 - Yoga and Pilates in the park. Everyone has a favorite park or outdoor environment they like to go to relax. Pilates and yoga are excellent for relieving stress while also building muscle and burning fat. When performed outdoors in the sun, you benefit from fresh air and all of the wonderful sights, smells and sounds that mother nature has to offer. Exercising outdoors has been directly linked to an improved self-image, fewer feelings of stress, anxiety and depression and a higher calorie burn than working out indoors. Get out today, practicing the above outdoor exercise plans to grab those benefits for yourself. Learn more here about how to create a home fitness program for beginners and athletes.